Why is it that we use divination? What are the benefits? 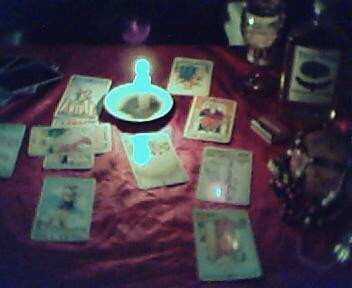 Divination has a very important role in Vodou. Divination is one of the most sought for services from a Houngan or Mambo. The most common method of divination in Haitian Vodou is the use of playing cards. Houngans and Mambos may also invoke possession of a lwa to give the reading. Divination allows us to see what the problem may be, the true root of that problem (because the cause of the problem may be something different than the surface problem), what lwa are involved or interested in the situation, and what is the best solution for a problem. As stated, there are a number of ways that divination is done in Vodou. Readings may sometimes be referred to as a "leson" or a lesson. That is what the person will have a lesson on their life. Most Houngan and Mambo read playing cards. We can also call a Lwa to divine. Many Houngan and Mambo have a particular Gede or sometimes Ogou that is most frequently called for clients to divine. Alternately, the Houngan may use a glass of water and a candle. I personally divine using playing cards, tarot cards, the glass and water, dreams and possession. The Lwa themselves might use a number of ways to divine for the person also. Divination is used all the time! Sometimes it is done before the wanga (to see what is the best route), help determine it's outcome/success, to see if so and so likes the client, identify the root problem, the solution, etc. It also is one of the least expensive services that one may receive by a Houngan or Mambo. I always reccomend divination before anything else! Why wouldn't you want to see the right road on which to walk? Some people reject my reccomendation, though, and go on straight into getting what they want. Very often times, the root of a problem is very different than what the actual problem is. Many times, the client does not know the root of the problem. For example, a problem in your relationship may be manifesting because of an angered or jealous lwa, an aggressive wanga sent to you, your own undoing, jealousy, a mother or father in law, etc. There are a million different possibilities, but usually by identifying and fixing this root problem, everything else falls into place. Many times, I have found that the solution that divination provides is often smaller than the original solution the person thought they needed. For example, I had a woman here who was having financial problems, problems at work, problems at home, on and on. She thought that the best solution would be a huge service to Ezili Freda. Divination revealed differently. Ezili Freda wasn't involved in the situation at all! The solution was a simple cleansing. So that is what she did! I called the Lwa in my head and the Lwa administered the cleansing. Two days later, she called saying that the Lwa gave her a dream of the exact person who was creating all her problems. The Lwa told my client that she would be taken care of. Take care of her they did and my client's life returned to peace. Problems resolved, she got a chance to make some money on the side, she even got a promotion at work! Sometimes the opposite is true. Sometimes there is alot of hard work ahead for the person's problems to be resolved. Either way, I take care of it. Houngans and Mambos take care of their clients, take care of their problems. Once we know which road to take you on, we can lead you there. The reading may turn that a Lave Tet, a dance, a wanga, a gad, or any other number of things need to be done. It's discovery is half the work! But only half, the reccomendations should be taken for the person to benefit. Sometimes I tell people to stay away from someone and they do just the opposite! It doesn't matter, oftentimes they will come back and say "Houngan, you were right .. .. .. ."